the light shining on the water of the Hudson. picturing them among subways and gringos. their bones polished by desert sand. they are called carne, meat. 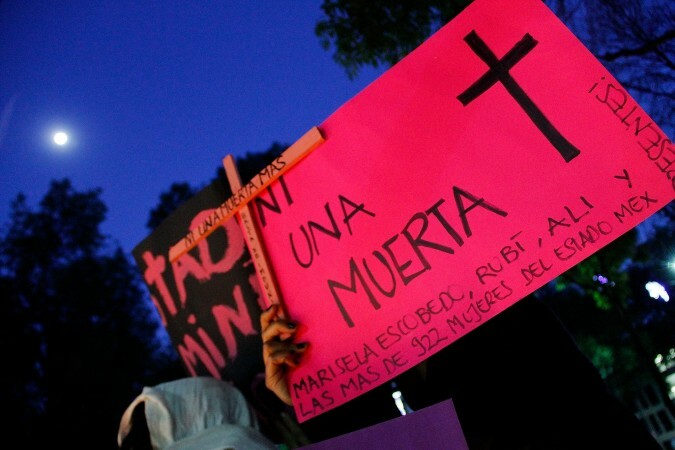 The above is one of dozens of images found by searching "ni una más" on google image: this one is located on the excellent indymedia site desinformémonos (disinform ourselves), where you can also find a photo gallery of images from the anti-violence march from Cuernavaca to Ciudad Juárez last month. I’ve been thinking about this commentary for weeks, planning for it, working closely with Román on the translation he initiated and originally read at one of the Evenings of Various Wonder at my home. And now that I’m in the midst of writing sentences I hope to share with you, whoever you are reading this, I find myself with almost nothing to say. What can be said? What does poetry have to say to the most intimate, embodied, close-range atrocities and to the most institutionalized, impersonal, structural brutalities? It’s not that I think the answer to these questions is “nothing”—¡on the contrary!—but rather that there isn’t a single thing to do or say to make these realities bearable, either on a personal individual specific level or an a collective sociopolitical (and also specific) level. Atrocity and brutality are not and will not be bearable. So it is the task of art-making, of conversation, of learning (in school and irregardless of school), of reading and writing and researching—of all the ordinary and extraordinary experiences that make up a day or a week or a month or a lifetime—to “say something” different than the violence we are forced to witness everywhere. To make manifest a different way of being in the world. Even in the most adverse of circumstances where our humanity and dignity and agency is eroded (or sandblasted or bomb-blasted) on a daily, minute-by-minute basis, it is possible to act with honor, clarity, self-respect, solidarity with others. It took me a while to figure out why the hunger strike at Pelican Bay (which inmates in at least one-third of California prisons are actively supporting with solidarity strikes, and which I encourage you to support by signing this petition and making any kind of noise you know how) kept reminding me of María’s poem and vice versa, why I kept returning to the hunger strike in my mind and via my browser as I fine-tuned the translation in an email exchange with Román. Perhaps it is that these two actions (each made of many actions)—the writing and public activation of this poem, a hunger strike based on demands for humane treatment—are two moments on a broad-spectrum continuum of speaking truth to power, taking direct transformative action for justice. Perhaps it is some sense that crystalline electrifying articulation of belief is in the deepest sense poetry. I actually think, however—in addition to the possibilities above—that the link in this train of thought between the Zócalo in Mexico City and the yards of high-security prisons in California and elsewhere is the idea of impunity, as illustrated by both the government-sponsored violence against civilians in Mexico and the government-sanctioned inhumane treatment of people ensnared in the prison industrial complex in the U.S. And one work that activates this link, for me, is the documentary “Presunto culpable” (“Presumed Guilty”), by Roberto Hernández and Geoffrey Smith, which follows the narrative of one person (of many) wrongly convicted and incarcerated in Mexico for a crime he did not commit. The film was censored shortly after its release, but is available on YouTube; though there have been multiple court decisions in favor of the filmmakers’ right to show the film, the case is still in litigation (though some press suggests otherwise). Silence colludes with impunity, makes it invisible, the shackling scaffold of the status quo. What I have to say—perhaps what any of us has to say—is entirely inadequate to the matters at hand, irremediably and disappointingly not enough, never enough. And not saying it—whatever it is—is absolutely and undeniably not an option. Even when “what can be said?” is all there is to say, as when death is being addressed, there is nothing to do but to say it.